Lexington, KY – May 14, 2015 – The flashy 12-year-old chestnut gelding Clouwni has seen the world. He helped Brazil place fifth at the 2014 World Equestrian Games in Caen, France and jumped double-clear at the 2013 FEI Furrisyya Nations Cup Finals in Barcelona. 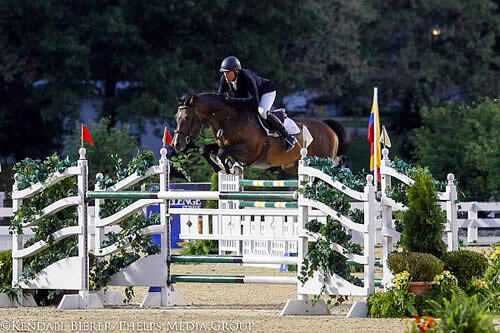 Thursday night, Clouwni showcased his speed and scope during the $34,000 Hagyard Lexington Classic CSI3* with rising talent and new owner Emanuel Andrade (VEN), as the pair raced to the win with an untouchable 37.690-second jump off time. Out of a start list of 61 horse and rider combinations, only 17 were able to master Bernardo Cabral’s opening track to take on the seven obstacles in the speed course. Shane Sweetnam (IRL) and Chaqui Z, owned by Spy Coast Farm, LLC of E Setauket, NY, were the first to break the 40-second pace set early by trailblazer Eugenio Garza and Bariano, owned by El Milagro of Hickory Creek, TX, stopping the clock in 39.870 seconds. Fellow Irishman Kevin Babington challenged Sweetnam with Shorapur, owned by Shorapur LLC of Antioch, IL, slicing the turns and racing to the time of 38.540 seconds. That did not keep Andrade from trying. Andrade began the course with a speedy opening line where he left out a stride, doing six instead of seven to the oxer. He was on pace with Babington throughout the course until he landed from the vertical and saw the distance that would make the difference. Andrade landed from the signature Hagyard Lexington oxer in a much quicker 37.69 seconds, a time that the remaining five riders could not touch. Andres Rodriguez and Fifty Fifty 111, owned by ARAO Enterprises LLC of Wellington, FL, broke the beam in 38.860 seconds, but were still more than a second from catching Andrade’s time. David Beisel was one of the last to challenge with the little 10-year-old stallion Amaretto, who set off down the first line, bucking and kicking out as they approached the first fence of the jump-off track. Although doing seven down the first line may have lost Beisel the time he wanted, his time was impressive enough to take over second place in front of Babington with 38.110 seconds. He may have been the smallest horse in the class, but at barely 16 hands, Ammeretto has proven himself to be a formidable competitor with Beisel in the saddle – what he lacks in height, he makes up in speed and agile turns. Tonight’s victory will earn Andrade valuable points towards the Hagyard Challenge Series, with seven grand prix classes to be held during the 2015 show series at the Kentucky Horse Park. Following the final event, a cash prize of $50,000 will be awarded to the rider accumulating the most points throughout the series, as well as a $10,000 prize for the reserve champion. The jumper action at the Kentucky Spring Classic will continue tomorrow with the $20,000 1.45m Bluegrass Classic in the Rolex Stadium. This week’s highlight events also include Saturday evening’s $127,000 Hollow Creek Farms Grand Prix CSI3*, and the $50,000 Commonwealth Grand Prix CSI3* on Sunday.